Fri 7 Apr 06 7.30 pm Church Room (1) PowerPoint presentation by Dr Andrew Ormerod of the Eden Project on aspects of food and agriculture. Andrew will be discussing the main world-wide staples (rice, maize, wheat, bananas and plantains), and how they are utilised by different peoples. FOSB will be laying on a very simple buffet illustrating some of the dishes made with these ingredients. Tickets £5 including refreshments. 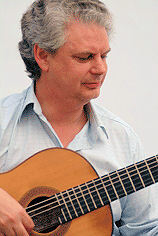 Raymond Burley is one of Britain’s most experienced guitarists. He has performed in America, Europe and Britain with leading orchestras, many ensemble combinations and as a soloist. He told FOSB "Dear Tremar, Thanks for the info. I'll be playing works by Froberger, Sor, Barrios, Lutoslawski, Pujol, Vinas, Smith Brindle and Dyens. I imagine you don't need definite items yet. If I'm wrong just let me know. Very best wishes, Ray." Ticket price £7.00 available mid April 2006 from Lostwithiel Tourist Information Centre 01208 872207 and at the door on the night. Tue 11 Jul 06 7.30 pm St Bartholomew’s Church Lostwithiel (4) Cornwall Youth Brass Ensemble Concert Tickets £5. A free glass of wine will be available. Cornwall Youth Brass Ensemble is made up of the most talented brass students in the County. CYBE play a wide variety of music from Palestrina and Lotti, to Mendelssohn, to a great many commissions by David Frost - the Head of Brass for the County and prolific composer. David Frost directs CYBE along with Tim Carleston, another brass teacher in the County. An evening with CYBE is guaranteed to provide fantastic exposure to the great brass sound! Fri 17 Nov 06 7.30 pm Church Room, Lostwithiel (7) Illustrated talk by Kitty and Tremar Menendez relating their recent experiences in Morocco, where they went under the auspices the Eden Project, the party being led by Sir Ghillean Prance.